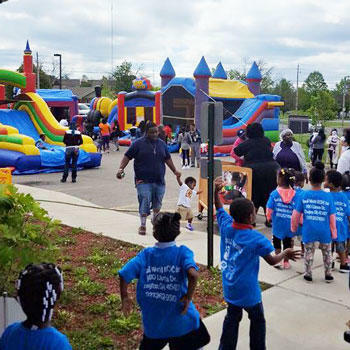 MISSION STATEMENT - The Inflatable Fun Co. is on a mission to bring happiness and joy to children and adults alike by providing state of the art inflatables, games and other party equipment. The Inflatable Fun Co. was formed in 2006 by two college buddies, Les Goldfarb and Christopher Kulhavik. Starting their business from the grass roots, literally, their focus on high quality and cleanliness makes The Inflatable Fun Co. a leader in the industry. Starting locally, they purchased their first 2 inflatable units and focused their efforts within the City of Cincinnati. As they grew, their marketing efforts began to reach the entire Tri-State area and beyond to Dayton. Today, The Inflatable Fun Co.continues to seek out new and exciting inflatable units, games, and party equipment for it's customers.